We have used improved incoherent scatter radar measurements at the Jicamarca Radio Observatory to study the height variation of the F region vertical plasma drift velocity (driven by the zonal electric field) during moderately quiet conditions. Preliminary results indicate a nearly linear change of the vertical drift velocity with altitude between 200 and 700 km, but with considerable day-to-day variations in the value of the slope. On the average, the velocity gradients are positive in the late night and morning periods and negative during the afternoon and evening hours. 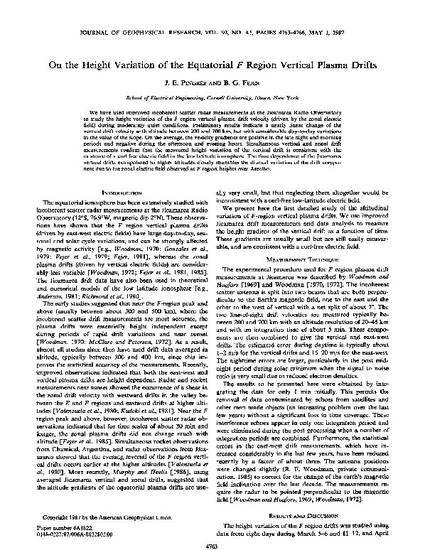 Simultaneous vertical and zonal drift measurements confirm that the measured height variation of the vertical drift is consistent with the existence of a curl free electric field in the low latitude ionosphere. The time dependence of the Jicamarca vertical drifts extrapolated to higher altitudes closely resembles the diurnal variation of the drift component due to the zonal electric field observed at F region heights over Arecibo. Pingree, J. E., and B. G. Fejer, On the height variation of the equatorial F-region vertical plasma drifts, J. Geophys. Res, 92, 4763, 1987.